This article by Ali Abunimah is re-posted from Electronic Intifada. But in fact, the vast majority of those killed and injured were unarmed civilians. Up to 20 November, according to the Palestinian Centre for Human Rights, 91 of the 136 Palestinians killed were civilians, including 28 children and 13 women, and 922 of the 941 wounded were civilians, including 258 children. So 66 percent of those killed, and 97 percent of those injured were civilians. Almost one third of the dead are children. PRI, notably, did not challenge Ayalon on his false assertions. 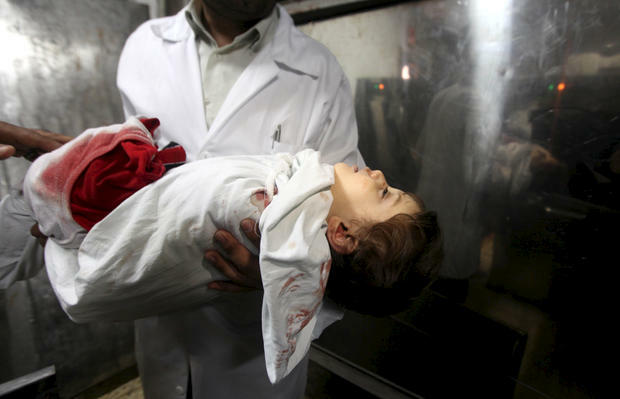 News reports say that at least 22 more Palestinians were killed on 21 November, including at least two more children. A video by Egyptian citizen journalists taken at Gaza City’s main hospital vividly shows the extent of the deaths and injuries to civilians. Many families are gathering in overcrowded apartments located in areas that they hope are less likely to be targeted. However, as shelling of residential building persists, the population grows weary and evermore fearful. The remaining 34 percent of the dead presumably include members of Palestinian resistance factions, some of whom will have been killed by Israel in what amount to extrajudicial executions while they were in their homes or other places. It is only by comparison with the dire situation in Syria that Ayalon hopes he can prettify Israel’s horrifying crimes. But it is clear that Israel’s crimes, and the responsibility of leaders like Ayalon for directly ordering them or complicity in them, stands on its own. Since Israel began its attack on Gaza on 14 November, breaking a tenuous ceasefire, four Israeli civilians and one soldier have been killed in fire from Gaza and 21 Israelis were injured this morning in a bomb explosion on a bus near Israel’s “defense ministry” in the heart of Tel Aviv. Ayalon’s comments came as Israel and Palestinian resistance factions agreed to a ceasefire, to take effect this evening. Under the terms of the deal brokered by Egypt, Israel will cease all attacks, incursions and extrajudicial executions in Gaza and ease the blockade, while Palestinian factions will refrain from firing toward Israel. What remains to be seen is if the ceasefire will take hold and if Israel will implement its terms, given its history of violating such truces.